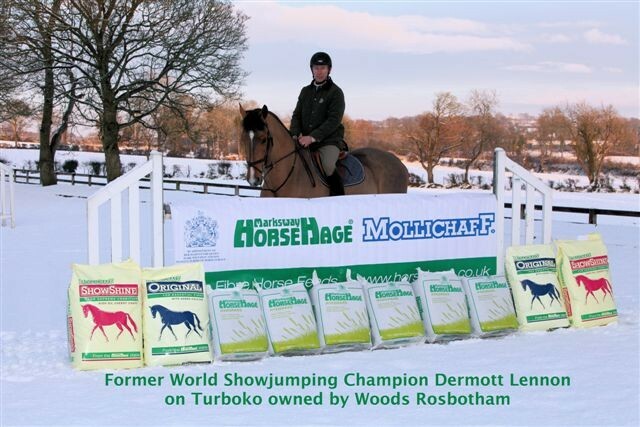 Our comprehensive Mollichaff range offers a choice of high quality chaffs to add bulk and fibre to your horse’s diet, as well as a complete feed aimed at laminitics and a complete forage replacer aimed at veterans. Our specialist chaff range has five tasty options and is made from top quality oat and wheat straws, alfalfa and dried grass. It is dust-extracted, chopped and lightly dressed with a unique low sugar coating, using a special process that covers every part of the chaff evenly to make it very palatable. This gives our chaffs an open texture, unlike heavily molassed chaffs which can be sticky and lumpy. 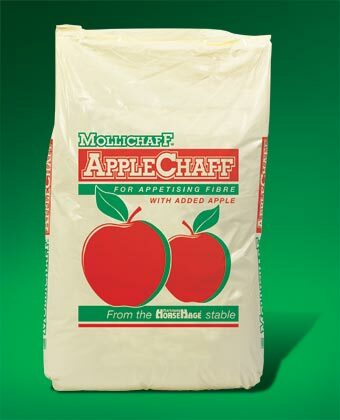 A high quality chaff with the addition of real apple pieces and apple essence. Made from the highest quality straw - chopped and dust extracted. Contains a unique, low sugar dressing. 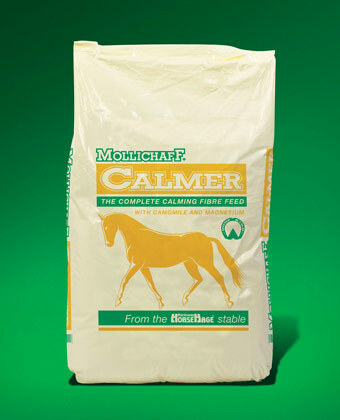 Mollichaff Calmer is a highly palatable, complete fibre feed designed for horses and ponies prone to nervousness or excitability. It contains a balanced blend of fibre pellets, oat straw, dried grass, herbs, soya oil, vitamins, minerals, limestone and trace elements. 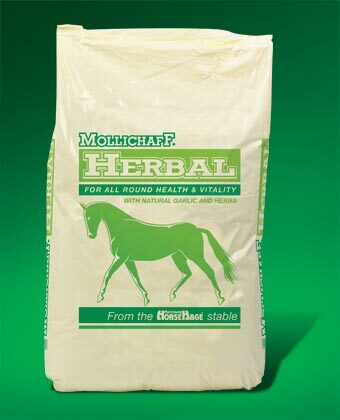 Along with a carefully formulated combination of camomile, lemon balm and mint, Mollichaff Calmer supplies elevated levels of magnesium, as a diet deficient in magnesium can result in increased muscle contraction, making the horse less able to relax and more likely to become excitable or ‘fizzy’. Mollichaff Donkey is a highly palatable mix containing a balanced blend of fibre pellets, oat straw, and soya oil with camomile, mint and lemon balm. It also contains a broad spectrum vitamin and mineral supplement, which includes limestone and magnesium. Magnesium is often deficient in UK soils and is an important factor in the nutritional support of many metabolic processes in the donkey as well as helping to maintain a healthy nervous system. Deficiency in this mineral may be associated with glucose intolerance and insulin resistance, both of which are important in the nutritional management of laminitis. Limestone provides additional calcium for strong bones and healthy growth. 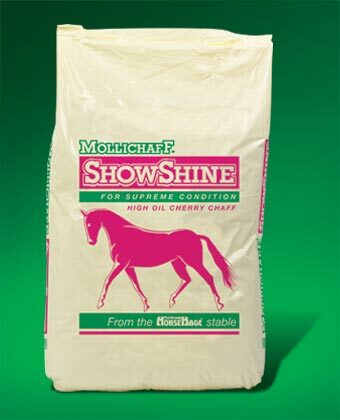 Mollichaff Donkey is low in sugar, starch and energy and carries the HoofKind logo to denote that it is suitable for laminitic donkeys, mules, horses or ponies. 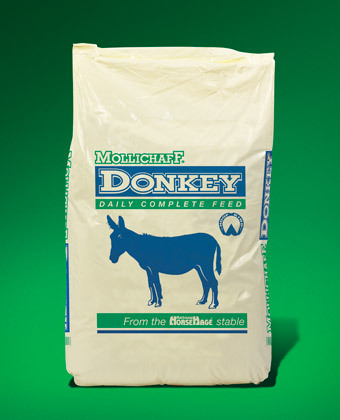 When Mollichaff Donkey is fed at the recommended levels, it needs no further supplementation other than good quality forage, or it can be used as a total forage replacer. At least 1.5% of bodyweight should be fed in total food per day, including forage, even to overweight donkeys. HoofKind is a highly palatable mix containing a balanced blend of oat straw, alfalfa, fibre pellets, soya oil, vitamins, minerals, trace elements, antioxidants and therapeutic levels of biotin. HoofKind is low in starch and sugar, high in fibre and does not contain any cereals. 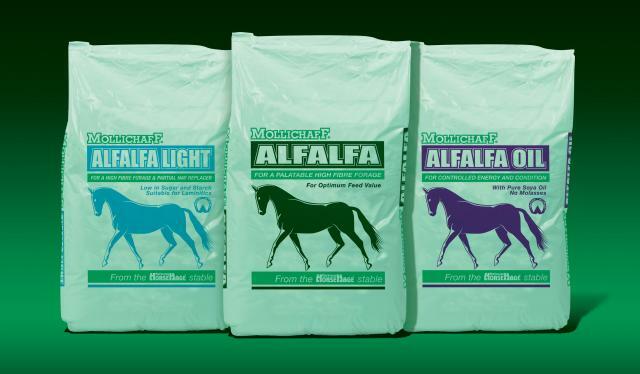 HoofKind provides a low level but high quality protein and restricted calories and so provides limited, controlled energy from high quality digestible fibre and oil-based ingredients, making it an excellent feed for ‘fizzy’ horses and good doers, as well as laminitics. 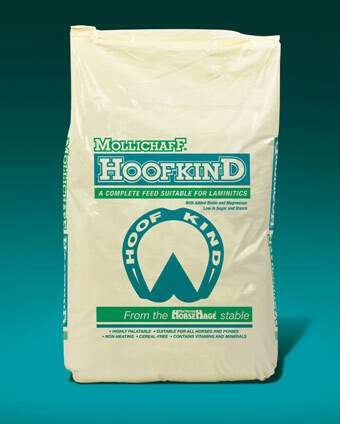 HoofKind contains a broad spectrum vitamin and mineral supplement, and when fed at the recommended levels to horses at rest or in light work, HoofKind needs no further supplementation other than good quality forage such as High Fibre or Timothy HorseHage. HoofKind contains additional therapeutic levels of biotin. Independent, scientific studies have found that supplementing an average horse’s diet with 15mg of biotin per day can greatly increase both the growth rate and the hardness of the hoof. 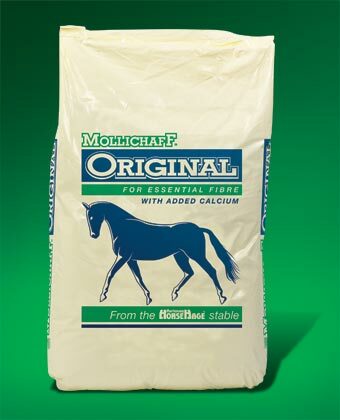 Mollichaff HoofKind has been specifically formulated to ensure that these levels are met. For an average 500kg horse, feeding the required 2.5kg per day will provide the required 15mg of biotin. HoofKind contains added magnesium. Magnesium is often deficient in UK soils and is an important factor in the nutritional support of many metabolic processes in the horse. Deficiency may be associated with glucose intolerance and insulin resistance, both of which are important in the nutritional management of laminitis. Magnesium also plays an important role in maintaining a healthy nervous system, and may help in the nutritional support of anxious or “spooky” horses. Additional natural plant-based antioxidants are also included in HoofKind. Antioxidants help mop-up free radicals and assist in the nutritional support of prevention of damage to cells and cell membranes. The antioxidants in HoofKind have been specially selected for the nutritional maintenance of the immune system, the respiratory system, the circulatory system and the all-important hooves and laminae. Contains a unique coating, combining high levels of soya oil with a low sugar dressing, to give a bloom to the coat and added condition. Mollichaff Veteran contains added limestone to provide additional calcium for strong bones. Salt provides two important electrolytes – sodium and chloride. Also contains added limestone to provide additional calcium. For guidance on how much to feed, please contact us for a ration suggestion based upon your horse or pony’s individual needs. Veteran contains only natural ingredients. A high quality chaff combining straw and a low sugar dressing with the addition of calcium. Made from the highest quality wheat straw - chopped and dust extracted. Contains a unique, low sugar coating. A high quality chaff made from the best oat straw with the addition of a variety of herbs found in the horse’s natural environment. Contains a balanced mixture of Garlic, Mint, Rosemary and Golden Rod. Garlic helps to maintain healthy respiratory and digestive systems as well as being a natural fly repellent. Mint improves palatability, and again helps maintain healthy respiratory and digestive systems. Rosemary aids digestion and stimulates appetite. Golden Rod also stimulates appetite and helps maintain a healthy skin and coat. Has a unique, low sugar dressing.